- NTSC Mode (60Hz): 480P/720P. - PAL Mode (50Hz): 576P/720P. VGA output supports resolution: 640x480/ 800x600/ 1024x768. - NTSC Mode (60Hz): 480P/ 720P. - PAL Mode (50Hz): 576P/ 720P. - NTSC Mode (60Hz): 480P/ 720P/ 1080i. - PAL Mode (50Hz): 576P/ 720P/ 1080i. VGA output supports resolution: 640x480/ 800x600/ 1024x768/ 1280x1024. - NTSC Mode (60Hz): 480P/720P/1080i. - PAL Mode (50Hz): 576P/720P/1080i. HDMI Output:480P/ 720P/ 1080i/ 1080P. - NTSC Mode(60Hz):480P/ 720P/ 1080i. - PAL Mode(50Hz):576P/ 720P/ 1080i. 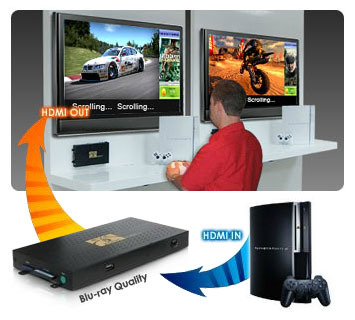 VGA output supports resolution:640x480/ 800x600/ 1024x768/ 1280x1024/ 1360x768 HDMI Output: 480P/ 720P/ 1080i/ 1080P. VGA Output: 640x480/ 800x600/ 1024x768/ 1280x1024/ 1360x768/ 1366x768. YPbPr Output: 480p/ 720p/ 1080i. HDMI Output: 480P/ 720P/ 1080i/ 1080P. 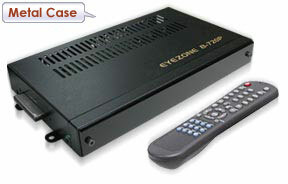 - VGA Output: 640x480/ 800x600/ 1024x768/ 1280x1024/ 1360x768/ 1366x768. - YPbPr Output: 480p/ 720p/ 1080i. 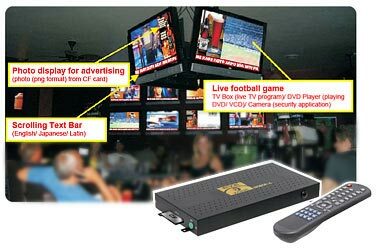 Available Outputs Y.Pb.Pr, S-Video, Video, VGA and Audio output Y.Pb.Pr, S-Video, Video, VGA and Audio output (optional VGA to Y.Pb.Pr cable). 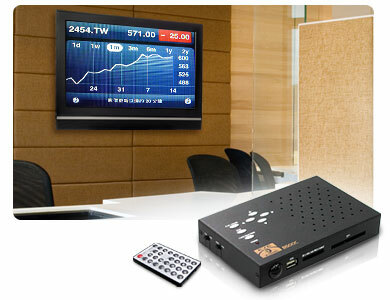 Y.Pb.Pr, S-Video, Video, VGA and Audio output Video, S-Video, VGA, Y.Pb.Pr, HDMI and Audio output. 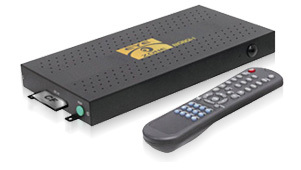 Video, S-Video, VGA, Y.Pb.Pr, HDMI and Audio output. Video, Y.Pb.Pr (optional VGA to Y.Pb.Pr cable), HDMI, VGA and Audio output. Playback Modes / Features Slide Show Function with 14 transition effects, One File Repeat Function, USB Auto-Copy. Auto Play Function, Zoom x 4 Auto Play Function, Zoom x 4 Windows Media Player 11 compatible, NTP Network (G.M.T) Timer, Embedded FTP Server, Export configuration, Auto Key Lock function, HTTP Command function, FTP Auto Download Function, Universal Plug and Play (UPnP) and DHCP, SLIDE SHOW Function (interval time with 10/ 15/ 30/ 60 seconds) ,RS-232 port for computer control with ASCII command (play, stop, pause…etc). 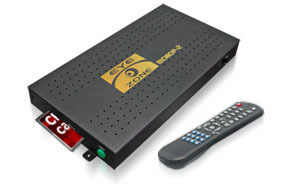 Export configuration, Auto Key Lock function, HTTP Command function, FTP Auto Download Function, Universal Plug and Play (UPnP) and DHCP ,RS-232 port for computer control with ASCII command (play, stop, pause…etc), Zoom x 4. Schedule Function, Export configuration, Auto Key Lock function, HTTP Command function, FTP Auto Download Function, Universal Plug and Play (UPnP) and DHCP, SLIDE SHOW Function (interval time with 10/ 15/ 30/ 60 seconds) ,RS-232 port for computer control with ASCII command (play, stop, pause…etc). 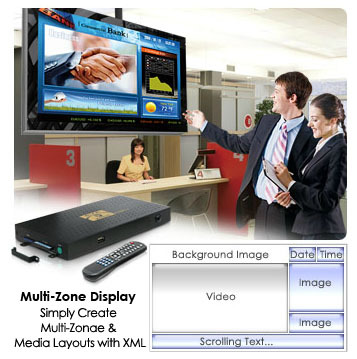 Multiple Display Zones, Scrolling Ticker, Log Function, Download Pause / Resume Function, NTP Network (G.M.T) Timer, Embedded FTP Server, Schedule Function, Export configuration, Auto Key Lock function, HTTP Command function, Windows Media Player 11 compatible, FTP Auto Download Function, Universal Plug and Play (UPnP) and DHCP, SLIDE SHOW Function (interval time with 10/ 15/ 30/ 60 seconds) ,RS-232 port for computer control with ASCII command (play, stop, pause…etc). Real Time A/V Input, Multiple Display Zones, Scrolling Ticker, Log Function, Download Pause / Resume Function, NTP Network (G.M.T) Timer, Embedded FTP Server, Schedule Function, Export configuration, Auto Key Lock function, HTTP Command function, Windows Media Player 11 compatible, FTP Auto Download Function, Universal Plug and Play (UPnP) and DHCP, SLIDE SHOW Function (interval time with 10/ 15/ 30/ 60 seconds) ,RS-232 port for computer control with ASCII command (play, stop, pause…etc). Built-in 3.5G module for internet access, Schedule Function, Export configuration, Auto Key Lock function, HTTP Command function, FTP Auto Download Function, Universal Plug and Play (UPnP) and DHCP, SLIDE SHOW Function (interval time with 10/ 15/ 30/ 60 seconds) ,RS-232 port for computer control with ASCII command (play, stop, pause…etc). Built-in GPS Module, Schedule Function, Export configuration, Auto Key Lock function, HTTP Command function, FTP Auto Download Function, Universal Plug and Play (UPnP) and DHCP, SLIDE SHOW Function (interval time with 10/ 15/ 30/ 60 seconds) ,RS-232 port for computer control with ASCII command (play, stop, pause…etc). 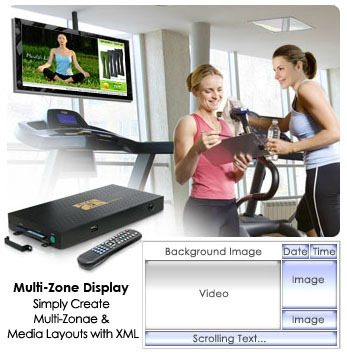 Multiple Display Zones (Create your own custom layout via XML), Scrolling Ticker, Log Function, Download Pause / Resume Function, NTP Network (G.M.T) Timer, Embedded FTP Server, Schedule Function, Export configuration, Auto Key Lock function, HTTP Command function, Windows Media Player 11 compatible, FTP Auto Download Function, Universal Plug and Play (UPnP) and DHCP, SLIDE SHOW Function (interval time with 10/ 15/ 30/ 60 seconds) ,bidirectional RS-232 communication (Transmit / Receive). - Receive: Using ASCII command to control B1080PX (play, stop, pause…). - Transmit: Control your device (such as TV, speakers or DVD player) to turn on/ off, volume up/ down or mute. Multiple Display Zones (Create your own custom layout via XML), Scrolling Ticker, Log Function, Download Pause / Resume Function, NTP Network (G.M.T) Timer, Embedded FTP Server, Schedule Function, Export configuration, Auto Key Lock function, HTTP Command function, Windows Media Player 11 compatible, FTP Auto Download Function, Universal Plug and Play (UPnP) and DHCP, SLIDE SHOW Function (interval time with 10/ 15/ 30/ 60 seconds), bidirectional RS-232 communication (Transmit / Receive). Available options Laser scanner, PIR Sensor, Schedule Function, Timer Function, S/PDI Output, Touch Sensor Buttons, Push Button Box, Optional VGA to Y.Pb.Pr Cable Wireless IR 5 sensitve touch buttons, PIR Sensor, Play Button box, HDMI cable, RS 232 cable, IR cable, HDMI cable, RS 232 cable, IR cable, Wireless IR 5 sensitve touch buttons, PIR Sensor, Play Button box, Schedule Function Wireless IR 5 sensitve touch buttons, PIR Sensor, Play Button box, HDMI cable, RS 232 cable, IR cable, Wireless IR 5 sensitve touch buttons, PIR Sensor, Play Button box, HDMI cable, RS 232 cable, IR cable, Wireless IR 5 sensitve touch buttons, PIR Sensor, Play Button box, HDMI cable, RS 232 cable, IR cable, Wireless IR 5 sensitve touch buttons, PIR Sensor, Play Button box, HDMI cable, RS 232 cable, IR cable, Wireless IR 5 sensitve touch buttons, PIR Sensor, Play Button box, HDMI cable, RS 232 cable, IR cable, Wireless IR 5 sensitve touch buttons, PIR Sensor, Play Button box, HDMI cable, RS 232 cable, IR cable, Bar Code Scanner, HDMI cable, RS 232 cable, IR cable, Wireless IR 5 sensitve touch buttons, PIR Sensor, Play Button box,. Bar Code Scanner, HDMI cable, RS 232 cable, IR cable, Wireless IR 5 sensitve touch buttons, PIR Sensor, Play Button box. Bar Code Scanner, HDMI cable, RS 232 cable, IR cable, Wireless IR 5 sensitve touch buttons, PIR Sensor, Play Button box.